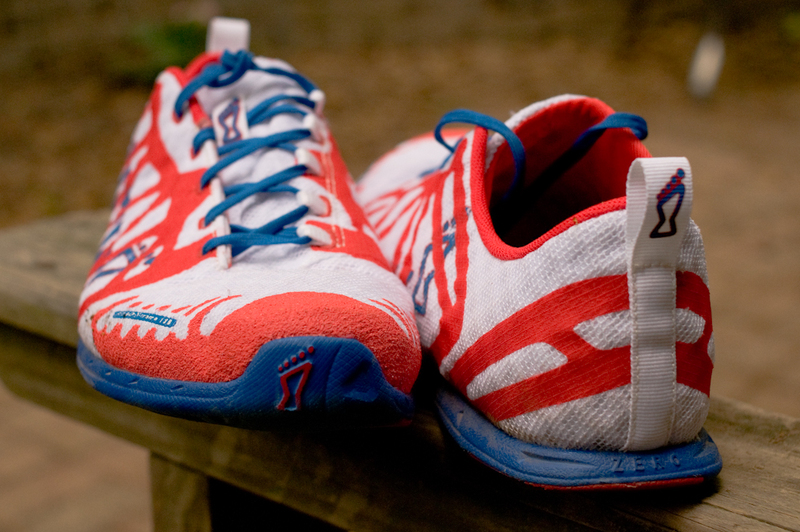 The Inov-8 Road-X-Treme 178 and 138 represent the lighter two thirds of Inov-8's all new Road-X-Treme product line. (There are women's-specific Road-X-Tremes, too, by the way) The Road-X-Tremes are fairly spiffy in the looks department, sure. But, I must admit that when I first saw these shoes listed on the SS13 release brochure, I raised an eyebrow. I said to myself, "Well, now, what's so 'X-Treme' about these new shoes? Hmmm?" No, I wasn't as doubtful as that raised eyebrow might make me appear. I was curious. I really wondered what Inov-8's design team created for their road-running fans that warranted such a noteworthy model name. I decided to find out. However, if you want to be more technical about the qualities of this shoe line, I'll point out that the first hint of awesomeness is in the shoe's grip on man-made surfaces. The traction is not just fine or good, it's x-to-the-treme, people! Those spots of hard, sticky rubber on the outsole provide the friction a runner wants on wet or dry, firm surfaces. Dashing down that paved greenway with an 8% grade? Oh, no worries, the Road-X-Treme won't let you slip. Anyway, the outsole is the shiniest feature here. That grip is excellent in conjunction with the fusion/injected EVA midsole (see Bare-X Lite 150). 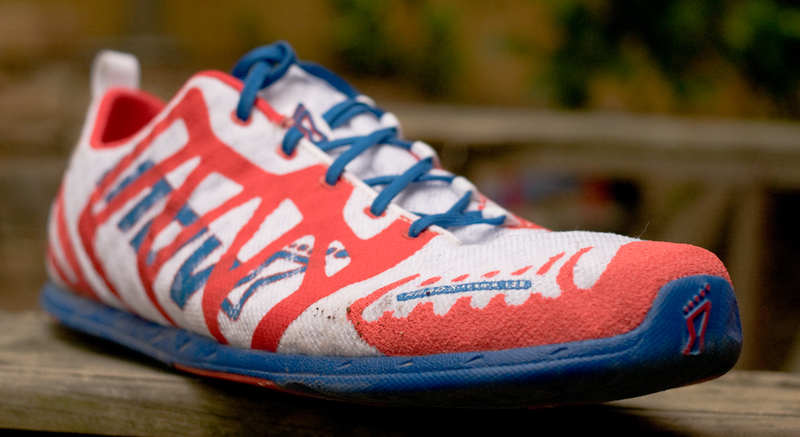 And, Inov-8 manages to provide the grip while keeping the shoes light and fancy. But, wait, of course, there's more. 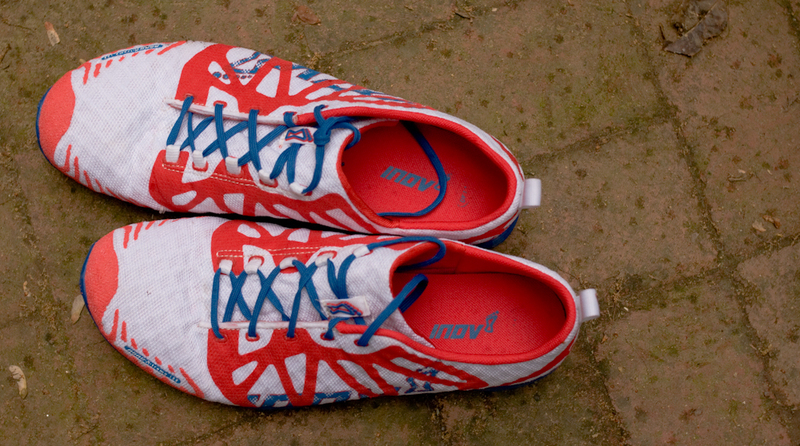 The Road-X-Treme shoe range boasts a few other nifty design elements that you've not previously seen on an Inov-8 shoe. For instance, the mixed-mesh upper is rather interesting. It's composed of large, open mesh on the interior with a tighter weave on the outside. I suspect this satisfies a perceived need to structure the upper while ensuring a suitable level of comfort and breathability. Also new to the Inov-8 design vocabulary: A single-piece upper, aka the burrito-style upper or no-tongue upper. But, I want to call it a sans-tongue tongue. So, let's call it that! You've seen this feature before on some New Balance, Brooks, and Skora shoes. Rather than stringing laces across a gap in the upper that's filled with a separate piece of upper, the mesh top of the shoe folds over itself instead. So, here's Inov-8 giving it a go. It's fine—pretty nice actually, because the sans-tongue tongue does not shift around like the traditional shoe tongues often do. Lacing on the Road-X-Tremes for the first time proved discombobulating at first, because the folding action seems almost too simple. I became used to it very quickly, though. And, I've found that it's easier to manage a secure fit without having to resort to the loop-lock lacing method in the upper-most eyelets. Okay, I broke out the "f" word. So, let's expand on the subject of fit. Thanks to the carefully conceived sans-tongue tongue, the Road-X-Treme 178 and 138 seem to fit best with their insoles in place. As usual, the insoles may be removed if you want to be 3mm closer to the ground. And, actually, these two shoes have a more supple inner lining than most of Inov-8's shoes. So, it's clear that the designers gave some consideration for sockless runners. However, the manner in which the single-piece upper attaches to the sole unit makes the contoured insole more of a necessity if I want to secure a precise fit. Granted, this isn't a big deal to me. The Road-X-Tremes "X-cel" in the cushioning department. So, I'm happy to let them be what they were made to be. The Road-X-Treme range features Inov-8's Natural Fit last (formerly Anatomical Fit), which has the most spacious toe box of all the Inov-8 lasts. The trouble with this Natural Fit, though, is that it's not exactly a reliable designation among the product lines, not yet, anyway. Inov-8 seems to change the last but not the name willy-nilly. For instance, the Bare-X Lite 150 is also built with the Natural(Anatomical) Last. But, it's toe box is noticeably wider than the Road-X-Treme's. 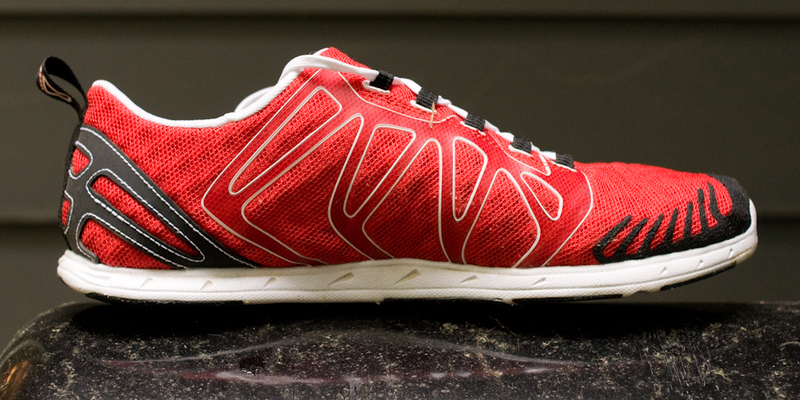 Likewise, the Trailroc 235 feels even wider in the toe area than the Bare-X Lite 150. So, even though the Road-X-Treme is built on the Natural last, it's not necessarily going to feel like other Natural lasted Inov-8s. And, that's why we have shoe reviewers like me, right? I'm supposed to tell you that the fit is not as predictable as you might think. Moreover, you need to know what to expect now that I've told not to expect what you might have thought you'd expect. For comparison, I'd say that the toe box feels pretty traditional in shape and girth, like a somewhat wider f-lite 230, maybe. The midfoot is a good width for my foot and adjusts well for secure fitting without pinching. The heel is roomy, but not overly so. The cozier toe box and soft EVA midsole make the Road-X-Treme 178 and 138 feel more like racing flats, to me, than the Bare-X Lite 150 or Bare-X 180. I kind of prefer to have my toes snug and secure in a toe box while running my fastest, I guess. 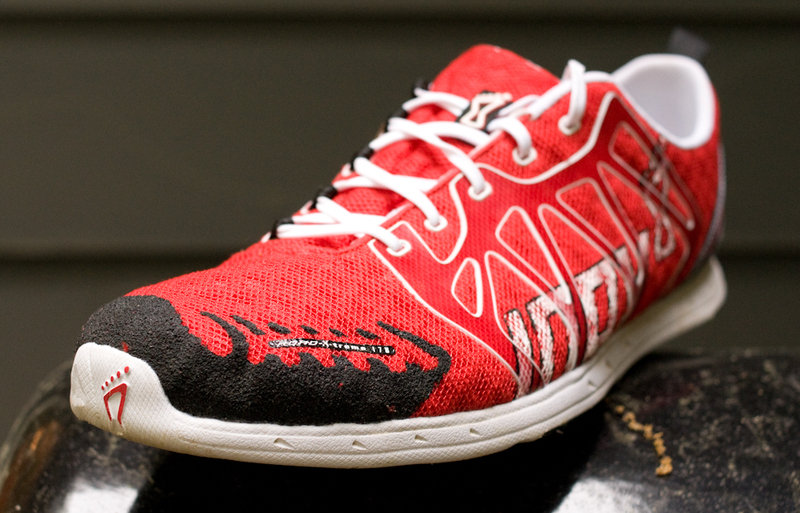 So, the Road-X-Tremes have actually become part of my go-to pile of shoes for any sort of speedier running. Admittedly, I would be happier if the toe box of the Road-X-tremes was exactly like the toe box of the Bare-X Lite 150. Combining that fit with the sole and upper of the Road-X-tremes would be fantastic for all road running applications, I think. I'll just wear something with a wider toe box when I want more mileage in a run, though. Assuming you don't care what your running shoes look like, being the prudent student of functionality that you are, I'm going to suppose that you wonder whether you should try the 178 or the 138. Don't know what those numbers mean, because you've never really cared to decipher Inov-8's method of product naming? That's cool. The numbers represent the weight of the shoe (size 9, maybe?) in grams. 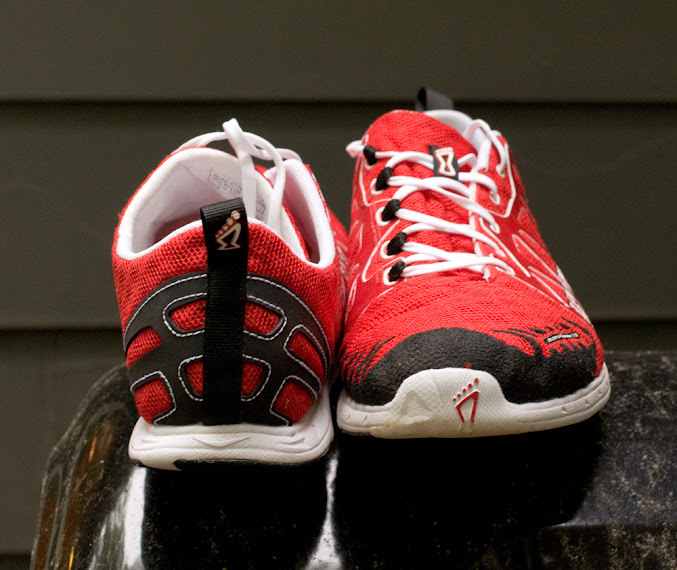 Both shoes are more than flexible enough for flat-surface running. And, that makes me happy, for sure. The drop? Yes, well, the 138 is a zero-drop shoe. And, the 178 has a 3mm drop. You can tell by the arrow or "ZERO" molded onto the sole's heel. This is all part of Inov-8's transition journey, which provides a system and range of products to facilitate the journey to running your best in minimalist shoes. The 3mm differential between the heel and toe of the 178 is not as conspicuous to me as I would have expected. Mostly, the 178 feels like a more cushioned version of the 138. So, if you want my opinion on the drop issue with regard to these two shoes, I'd say you don't need to worry about it. Instead, consider how much cushioning you want. If you want just a thin layer of soft cushioning to buffer your steps over rough pavement, the 138 (11mm + 3mm insole in the heel) would be your best bet. More cushioning than that, but not too much, would warrant trying on the 178s (14mm + 3mm insole in the heel). 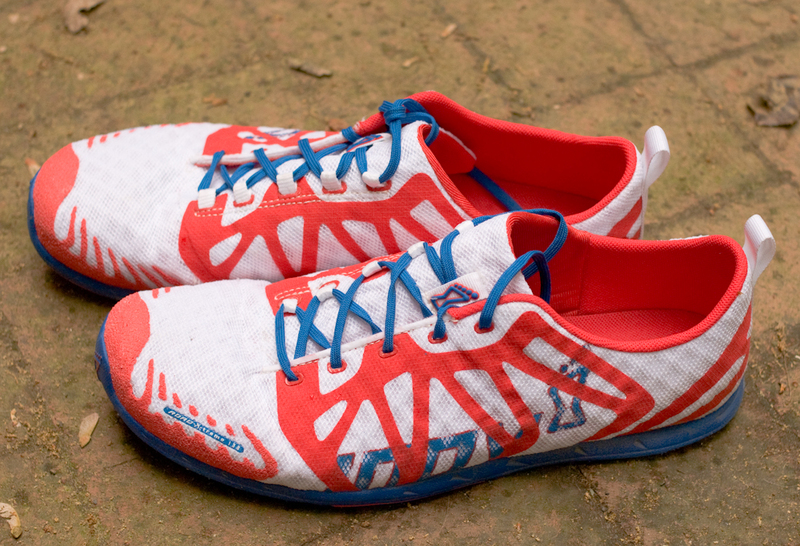 And, if you want even more cushioning, there's the Road-X-Treme 208, which I haven't tried. Be cautious if you are not used to running on lightweight, minimal-style shoes like this. That's the whole point of Inov-8's Transition Journey thing. The "x-treme-ly" soft EVA cushioning can be deceitful. And, you might end up running with heavier steps than your legs can handle. So, practice careful, patient running. The Road-X-Treme 178 and 138 are nice shoes. I like them quite a bit and will continue to use them weekly. They strike me as very well constructed shoes with laminated TPU on the upper that doesn't seem to put much strain on any of the connecting points to the sole. In fact, now that I think about it, this mixed mesh upper may be an attempt at using something more durable than Inov-8's traditional mesh material. As I've stated, the Road-X-Treme 178 and 138 do not feature a substantially wide toe box. So, if you have wider-than-average feet, you will probably not be comfortable in these shoes. But, don't let this narrow-ish version of a wide toe box disuade you from trying other Inov-8 shoes. I can't wait to try one of these Road-X-Tremes in a race. That grip on pavement is superb for moving fast. And, being that the X-Treme outsole is something of an upgraded Bare-X outsole, I imagine that I'll get between 400 and 500 miles out of these shoes before they need replacing. Of course, the EVA midsole is softer than that of the Bare-X midsole. So, we'll see how that goes. The Road-X-Treme range is available at numerous retail establishments. And, being that I am participating in an affiliate program with OptimalRun.com, I'll first recommend that you consider making your 178 or 138 purchase from those fine folks!